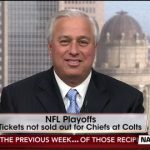 In recent interview with NBC 5, Ed Butowsky discusses the impact of the NFL lockout and the impact its having on NFL professional athletes caught in the middle. What is certainly being felt around the league is that as long as the NFL lockout continues players in the National Football League (NFL) will not receive a paycheck. Moreover these players will be hard pressed to find an equivalent salary elsewhere. Even with only six (6) days into the NFL lockout if players were not getting concerned before they surely are now. Ed Butowsky expresses that more than any other sport these players cannot afford a lockout because most players are not prepared and most will not recover from this lockout. It’s widely seen in the public that many of these players tend to live on 50-60% of what they make which accounts for the lavish lifestyles. Various athletes are flocking to alternative jobs like Troy Bergeron who normally plays for the Dallas Cowboys flocking to the Arena Football League. Ed says that this move to the AFL will only yield approximately 5% of the NFL average salary of $1.6 million. Many realize that while the AFL is something it does not compare to the salaries received in the NFL. Ed believes that lockout will come to an end soon, however, the scar this will leave on the players will remain. That scar put simply is the reality setting in when players will ask themselves “what will I do with the rest of my life when football is over?” This is a wakeup call to players to open their eyes and evaluate how they manage and save their money. The career span of an NFL player is typically 3-5 years, and this money needs to last them 40-50 years after they retire. One Response to "NFL Lockout Causing Growing Concerns With Professional Athletes"
We’re a bunch of volunteers and opening a new scheme in our community. Your web site offered us with useful information to work on. You’ve done an impressive activity and our whole community will probably be thankful to you.